When considering remote access solutions, customers sometimes have a few concerns about the safety of working on a system remotely. Secomea offers the following features to address the common concerns. Concern 1: Local site personnel should be able to control when the system is remotely accessible. Solution: You can tie a key or toggle switch to Digital Input 1 of the SiteManager which only allows remote access with the DI in the OFF state. In this manner, local personnel could disable/enable remote access with the turn off a key/flip of a switch at the local control panel. Concern 2: When remote access is enabled, can more than one remote technician potentially access the same PLC, controller, etc. at the same time, possibly causing a conflict? Below we look at the custom parameters for the agent I've named "CompactLogix". Here I have added a Custom Setting of "-X". 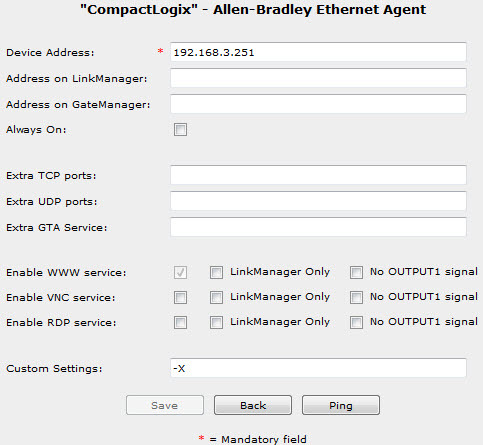 The "-X" indicates this device should have Exclusive Access: Allow only one LinkManager at a time to access this device; if a second LinkManager tries to connect, the connection will be rejected. It is significant to note this setting is available on a per agent basis. In this manner you can allow concurrent access for some devices, say an IP camera or a web server, meant to simultaneously service multiple users while setting exclusive access for others, such as PLCs or other critical equipment.